In what's being hailed as a first of its kind, a gay-friendly affordable-housing development financed entirely with public money is scheduled to rise in Philadelphia. Last week, the Pennsylvania Housing Finance Agency awarded $11 million in tax credits to the Dr. Magnus Hirschfeld Fund. The credits, combined with $8 million in preliminary funding from state and city grants, will allow it to build William Way Senior Residences, an affordable housing facility nestled in the heart of what the fund's website calls "the Philadelphia Gayborhood." The housing development, which is scheduled to break ground in the fall, calls attention to an increasing demand from members of the lesbian, gay, bisexual and transgender community for affordable housing that will allow them to live as seniors free from fear of discrimination. Affordable housing that dictates eligibility based on sexual preference is illegal, but developments like the planned Philadelphia facility can draw special interest from gays and lesbians through location and marketing. Floors 2, 3, and 4. Typical Accessible One Bedroom Unit. Another affordable housing complex that targets members of the LGBT community already exists in Los Angeles, and plans for at least two others are underway in San Francisco and Chicago. 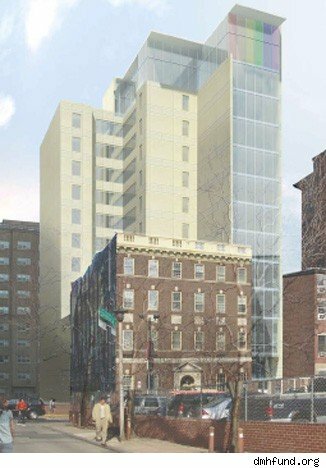 But William Way Senior Residences appears to be the first to receive all of its funding from government grants and awards, says Mark Segal, publisher of Philadelphia Gay News. Segal, who spearheaded the project, says he has spent around 10 years lobbying for an LGBT-friendly housing development in Philadelphia that would provide seniors with affordable living accommodations. "Most of them were in the closet most of their lives," he says of community members who may benefit from the facility. "They don't have the same support systems that other seniors would have." Philadelphia's gay seniors comprise a small segment of what the advocacy group SAGE estimates to be at least 1.5 million LGBT Americans who are over 65. SAGE, whose name is an acronym for Services and Advocacy for GLBT Elders, expects that number to double by 2030 as more baby boomers enter their retirement years. A recent study highlights just how important landing in an accepting community is for many of these seniors. When the San Diego LGBT Community Center polled seniors on their greatest concerns as they age, "LGBT-affirmative housing and housing affordability" ranked above health insurance and health care in importance for respondents, Senior Housing News reported. Triangle Square - Hollywood, an LGBT-friendly, 104-unit development built in 2007, was the first affordable housing community to cater to the rising demand from gay seniors. The Los Angeles facility cost $22 million to build but received private funding in addition to some tax credits, says Eric Harrison, executive director of Gay and Lesbian Elder Housing, which developed Triangle Square and is looking to expand into other markets around the country. In Chicago, Center on Halsted is planning a 90-unit apartment building in partnership with Heartland Alliance, scheduled for construction in 2013. "We're moving forward with the project. We've received some funding from the city," says Brian Richardson, director of public affairs for the center. Such developments can't come soon enough for Fanny Price, director of Philadelphia gay rights group, Philly Pride, who says the William Way project will meet the needs of local LGBT elders who otherwise would be hard-pressed to find comfortable living accommodations. "I know so many people that worked a lot of these bars, clubs and businesses, and you know they're older and they don't have benefits," said Price. "I'm kind of glad that they'll be able to live in some sort of affordable housing. You get to be yourself as you grow really old."